Eight of us traversed the stairway to the windowed cupola. One by one, we wound our way up the narrow, twisted collection of 144-year-old steps. t was the cupola where the ghost of John Denham had been seen most frequently. The air was heavy with the stench of fear. Or it could have been my sneakers. I’m not sure how I feel about ghosts. I’m one of those folks who doesn’t believe or disbelieve without concrete evidence. I’ve talked to enough credible people who have had strange, unexplained experiences and have no reason to embellish a story, so my mind is open and perhaps even hopeful. Frightfully small Monticello, Florida, is generally regarded as one of the most haunted towns in America. Monticellians pride themselves on their spooky reputation. Bizarre things seem to happen there all the time. 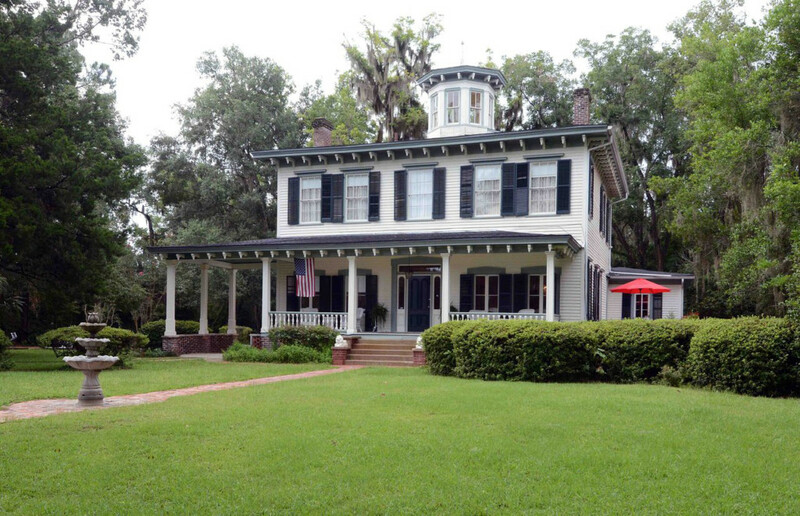 The John Denham House, a lovely B&B, is on the national register of officially haunted travel destinations. My wife and I, along with three other couples, had finally decided to spend a Saturday night getting the bejesus scared out of us. We cruised over late in the afternoon and checked into the Denham House to begin our ghost adventure. We carefully considered our plan to engage with the great beyond. First, we started drinking wine. Then, we had more wine. Finally, we had more wine. We were ready. We hired a wonderful woman who gives a walking ghost tour of the entire town for $15 per person. She was dressed in antebellum garb and held up her malfunctioning hoop skirt with one hand while carrying a spooky lantern in the other. She walked us by the elementary school where late at night children could be heard laughing and lights could be seen dancing through the hallways. Then she showed us a house where they’ve never been able to get the blood of a murder victim o the wall. Rumor had it that they replaced the wall and the blood showed up again. As we moved to the next location, we passed the tax collector’s office, and we agreed that it was the scariest place we’d seen. After cutting the walking tour short, mostly because we were having trouble walking, we decided it was time to go face to face with the dead Denham, and we headed back to the B&B. We were warned that actual sightings were rare. A “visit” would most likely feel like a cold breeze on the neck or involve a glance of a shadow sweeping by. Chances that Denham would pop up and ask for the car keys were slim. We made our way up to the cupola, sat down and waited. And waited. And waited some more. I finally did feel something on the back of my neck — a mosquito. Finally, we retreated to our rooms and slipped into bed, leaving one eye open. Berneice nudged me at 2 a.m. because she heard a light knocking. I thought I heard it, too. Then came what Berneice described as a “whoosh” sound near the stairs. And then sleep. We woke at first light to the aroma of breakfast. We pinched each other just to be sure we were still among the living.